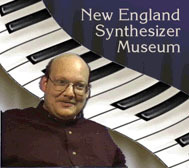 By Dave Wilson, curator of the New England Synthesizer Museum. My dad taught me how to solder when I was seven, and how to program a computer in assembly language when I was 12. Both of these skills have helped me in my synthesizer work. I compose and perform as well as maintaining the machines; I have perfect pitch, which is very useful when calibrating synthesizers. When acquiring machines for the Museum, I use a technique that is half Doctor Who and half Xena, the Warrior Princess.